We now estimate that 62 women have been killed by known or suspected male violence in 2015 in Australia alone, thanks to Real for Women’s annual count. but when we have a continuous stream of deaths due to an identifiable cause, and the perpetrators are male and the victims are female, we are silent. We struggle to name the agent, let alone analyse the cause. Even worse, we often see the perpetrators described as loving fathers and husbands and the violence described as a mystery. When an identified pattern of violence is erased by describing it as a mystery, that erasure is itself misogyny. We describe this pattern of excusing and erasing male violence with the hashtag #MysteryIsMisogyny. To end male violence against women, we need to start by naming it. 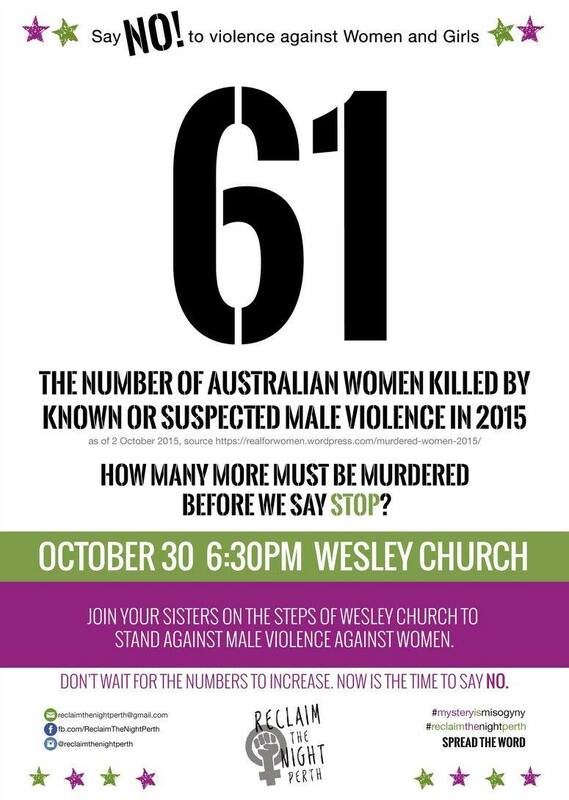 Join us at 6.30 pm on 30 October 2015 on the steps of Wesley Church (75 William Street Perth) to say no to male violence against women and girls. If you have any questions, please contact us via our facebook page or at ReclaimTheNightPerth@gmail.com.